The Blood Vomiting Game (as it is most widely known - see below) is one of the most famous games of the Edo period. It started on August 13th, 1835 and ended August 21st. 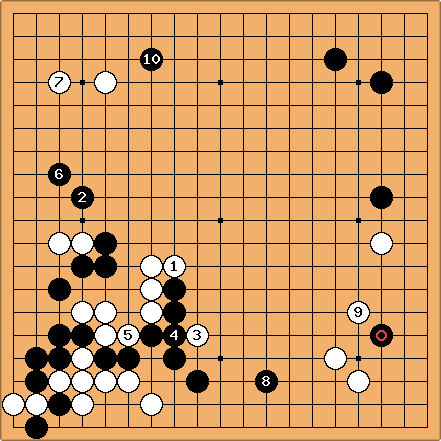 White is Honinbo Jowa 9-dan, the Meijin Godokoro. Black is Akaboshi Intetsu 7-dan, the pupil of Gennan Inseki 8-dan, 11th head of the Inoue-house. At the time, Jowa had been Godokoro for about 6 years. This game was part of many intrigues about the post. The whole issue started years before: already on Feb. 16, 1828 a game between Genan Inseki and Jowa was scheduled by Senchi. Genan Inseki had just been promoted to 8-dan too; not on grounds of merit by winning games but due to these intrigues. This game was cancelled in a heated discussion among the heads of Go houses and other players. Later, when Jowa did not live up to his secret agreement with Inseki - to turn over the post of Godokoro after 6 years (around 1834), Inseki thought of other means to force Jowa from the post. Intetsu sacrificed himself, metaphorically and in true sense, for his master. Despite his sickness he tried his utmost to win, so that Genan would have a valid objection against Jowa's claim for Godokoro and spoil his ambitions. Then Genan Inseki could apply himself for the post, because the 8th head of the Yasui house, Senchi was already 59 years old in 1835. This game is the result of these intrigues. A detailed commentary on the game and a full discussion of the historical background is given in the book Brilliance Jowa's 'Ghost Moves' Destroy Intetsu by John Fairbairn, published by Slate and Shell, 2012, SSJF009. Here is a partial game record containing the four moves that this game is famous for: the secret taisha joseki variation developed by the Inoue house, and the three moves that were supposedly brought to Jowa by ghosts, allowing him to grind Intetsu's lead (and life!) away. is an over-extension that is typical of Jowa's violent style. The Inoue school had developed this taisha variation starting with secretly. 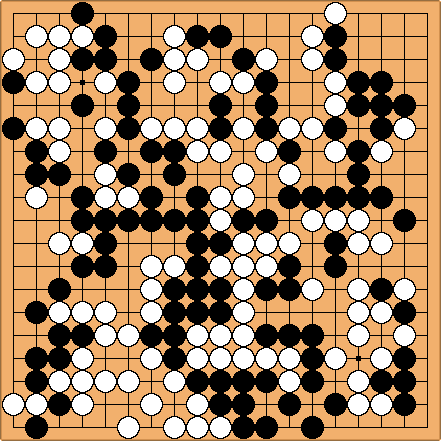 It allows Black to attack White's floating center group and absorb the two white stones on the left side at the same time. Black make an approach to White's shimari in the opposite corner instead of defending the stone White just attacked with a shoulder hit. The stone still has plenty of aji. 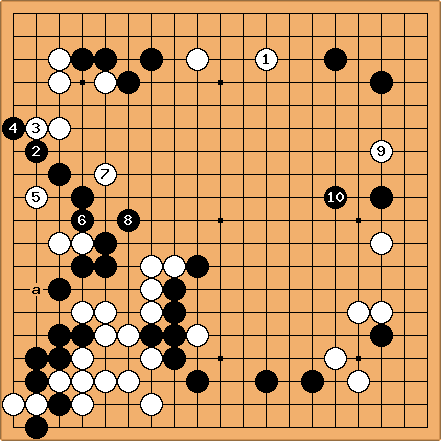 The stone causes White's enclosure to feel some pressure. Black can come back to the lower right later; playing there now is likely to make White thick. 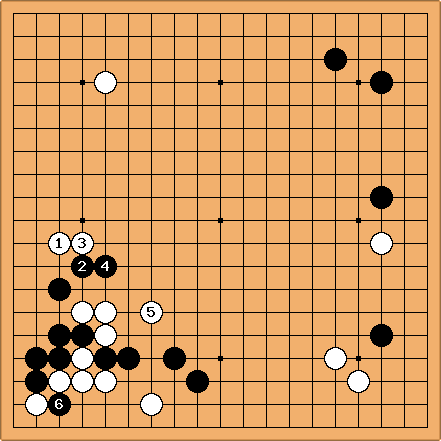 Moves 5 and 7 are the first two moves found by Jowa's ghost. According to Invincible they allow White to omit a direct answer to 4, because of aji at a.
is the third ghost move. 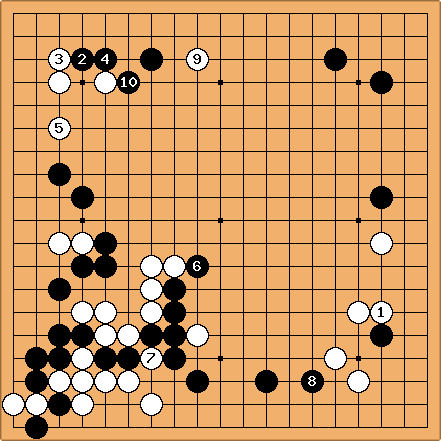 It is an example of a "bad shape/good move", and eventually allows Jowa to launch a difficult splitting attack that results in Black's resignation. Fukui Masaaki says in a commentary that according to modern positional judgement, even after White's three myoshu or ghost moves, Black's position is not at all bad. As the stones were being cleared from the board, Akaboshi Intetsu keeled over, coughing up blood (some sources say he collapsed at the board, and others "shortly after"...). As the four-day long game progressed and Jowa slowly clawed his way into the lead, Akaboshi's health had been steadily declining. Within two months, he was dead. Old Japanese did not distinguish between coughing and spitting up blood, but it apparently makes a big difference as to what was wrong with Akaboshi and how much he was affected. The distinction between spitting, coughing, or vomitting blood is not always an easy one to make. Akaboshi was in his mid-twenties when this game was played. That makes cancers less likely, although every medical student is taught that stomach cancer is most common in Japan. Akaboshi died on 20 October 1835 . The game ended on 21 August. Furthermore, Japanese sources usually refer to his death as "about 2 months" after the game. If the time frame is accurate, that is very consistent with tuberculosis. The old term 'consumption' is very descriptive. Symptoms include fever, cough with bloody or blood-flecked sputum, weakness, fatigue, weight loss. One might be ill for months or years before succumbing to the illness. In many ways, tuberculosis was the 'slim disease' of the 19th century. Certainly stress could irritate an ulcer. Alcohol makes all the above worse. Confusion can arise due to the difference between lunar date? and Gregorian date?. Also, "Invincible" states there were only a few days between game end and death, but this is generally not accepted.